Its 7 kilometres long fine golden sands accompanied by crystal clean crystalline waters extend from the village of Zahara de los Atunes to the cove of cabo de Gracia, cover all the centre of Zahara and Atlanterra. As if this were not enough, it is also one of the few locations where bothe the green of nature and the blue of the sea come together. Its waters, in addition to being clean and crystalline are also cool and should be bathed in, because once you try it, it is glorious. Another thing to bear in mind is that the beach has been designated Blue Flag status for the cleanest of European beaches for five consecutive years. When the wind is blowing in from the East you can take refuge from it by visiting Cala de Atlanterra, a magnificent beach protected by the mountains where there is a paradisical tranquility. The majority of the restaurants and bars are situated only a few metres from the beach. The collection of equipment and services is very complete. It is ideal for windsurfing and diving, and in addition there are nurses, lifeguards, ambulances, first aid points, showers and toilets. Zahara de los Atunes has been since earliest times the most important centre on the coast for the fishing of tuna in the style of the Almadrabas, hence its name. Its a beautiful fishing village with a location where you can enjoy the tranquility and beauty of its beaches, try exquisite snacks and meals in its large variety of bars and restaurants or saviour the quiet and informal environment of its food stalls and “copa” bars. Other options are horseriding on the beach at dusk or simply stroll and look at the craft in sight. It is a part of the community of Barbate and together they separated from Vejer de la Frontera in 1938. A night in Zahara de los Atunes should be sufficiently quiet but at times lively. You should go out late and enjoy a drink until the early hours in one of the large variety of food stalls and bars where you can also enjoy live music, generally flamenco and funk and bathe in the moonlight and stars next to the sea. Unfortunately, the food stalls are only open during the summer months, but the food stalls are not the only attraction. There are also quiet bars where you can enjoy a drink with friends or, if you want to dance, you can go to the "Discoteca Los tarugos". The nights are full of atmosphere in which distinct cultures can be found and good friends can be made. The most well known food stalls are: La Luna, El Buitre, La gata, Jonny Chiringo and the best bars are the Cafe Pub el Bullón and la Iguana. Atlanterra is a luxury tourist complex which extends to the edges of Cabo de Gracia. It belongs to the municipal district of Tarifa, but can only be accessed from Zahara de los Atunes. Atlanterra is situated in one of the most beautiful natural locations in Spain. Its location in the mountains but also its magnificent views of the Atlantic ocean make it a relaxing and tranquil paradise for the visitor. A collection of beachfront developments, chalets constructed on a slope with views of the Atlantic Ocean and luxury hotels make this location an enclave of international tourism. 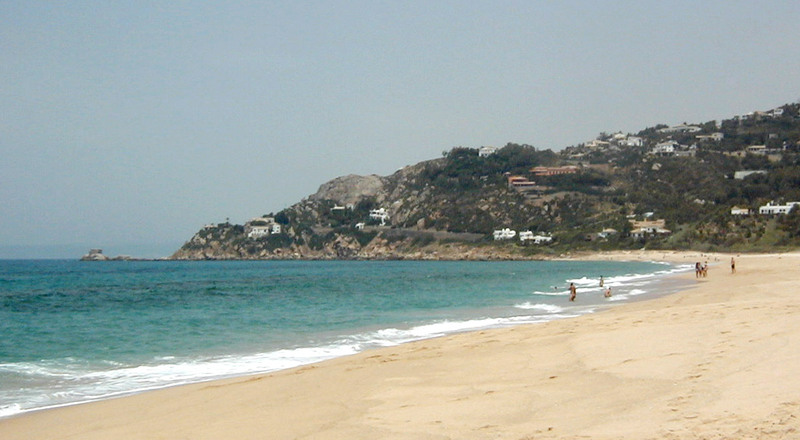 Atlanterra also has the "Playa de en Medio", a unique bay concealed between two slopes of the mountain. Zahara de los Atunes y Atlanterra form a unit collectively called Zahara.